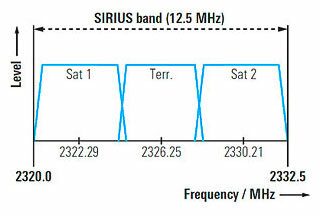 SIRIUS is a terrestrial, repeater-assisted satellite digital audio radio service (SDARS) in the United States for nationwide mobile car reception in CD quality. This is why separate traffic and weather channels are available alongside normal radio entertainment. Parts of the offered program are encrypted so that users must have an electronic serial number (ESN) radio ID in order to unlock their receivers. This diversity is of particular importance, since cities with skyscraper-lined streets make it difficult to transmit signals with only a single satellite. Therefore, two satellites with QPSK modulation are used to covers areas and regions with few buildings, while additional terrestrial COFDM repeaters bridge coverage gaps in the cities. Both systems come with sophisticated channel coding where successive data bits are transmitted separately over long periods of time (interleaving). This delivers interference-free reception in cars even if all receive paths briefly fail at the same time. The transmitted data stream contains a multiplex consisting of up to 100 services with 8 kbit/s to 64 kbit/s each. Advanced multiband excitation (AMBE) is used as the audio coding format for weather and traffic announcements; otherwise, aac+ is used.